More than twenty years ago, Jeremy Shepherd boarded a plane carrying pearls from China as a gift to his sweetheart. He never dreamed that his trip would lead him to become one of the world’s leading providers of high quality pearls. “Usually, pearls are sold through jewelers who have been in the business for decades. Our CEO bypasses the middleman—the jeweler—and that allows him to be able to sell quality pearls at 80 percent below retail,” Mia, his Chief Operating Officer, explains. He started out by offering strands of pearls on Ebay. At that time, there were few other options for online selling. Jeremy posted images of the pearls he obtained from China on one of his flights and before he returned, they had already sold out. He knew he was on to something and for a while, he continued selling pearls through Ebay. As his business grew, the internet grew with it. Now, his business, Pearl Paradise, has served more than 100,000 customers and are the world’s largest online pearl company. The key to growing his business was sourcing pearls directly from the farmers. Originally, he developed relationships with pearl farmers in China and later purchased a pearl farm there. Over time, he also developed relationships with farmers in Japan and Micronesia. These enabled him to provide Tahitian and South Sea pearls, as well as a greater variety of freshwater and Akoya pearls. He credits his fluency in three languages and love of travel for his success in fostering these ties. “Our CEO has been all over the world visiting pearl farms. His fluency in several languages helped him immensely in fostering trust and friendship with these farmers,” Mia shared. 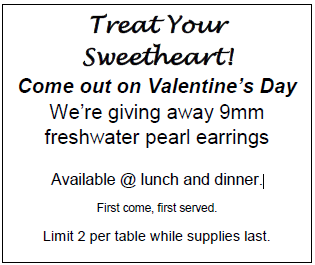 In 2016, Country House approached Pearl Paradise about supplying pearls for our St. Valentine’s Day and our Mother’s Day promotions. “The request was unusual because we don’t usually do wholesale sales. But we really liked what they were trying to do. After some discussion, we decided to source pearls specifically for Country House and worked with them to satisfy their needs. Now, we’ve been doing this every year,” Mia said. 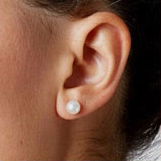 Be sure you don’t miss out on our St. Valentine’s Day pearl earring promotion, specially sourced just for Country House. The offer is available only as long as supplies last, so make sure you treat your sweetie!